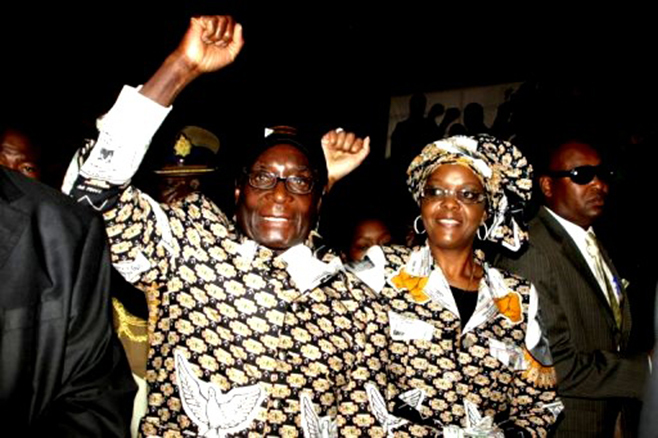 ZIMBABWE – Speculation has been rife in Zimbabwe that the Zanu PF constitution could be changed at its forthcoming December conference to make room for First Lady Grace Mugabe to take over the leadership of the party – that is if you believe the Zanu PF rumor mill. Sources say some within the party have been pushing to turn the conference into an extra-ordinary congress that could alter the constitution. But Zanu PF spokesperson, Simon Khaya, on Friday poured water on those expectations. Word doing the rounds in political circles is that the so-called Generation 40 group is trying to force a constitutional change in December and insert a clause stipulating that the party’s next leader should be a woman and in that way pave way for the first lady. This would give her room to become the party’s next candidate in the 2018 presidential election but there has been a lot of pushing back from within the party, according to sources. Khaya-Moyo said people should not expect any constitutional or leadership changes at the December conference in Victoria Falls, adding he is surprised by the interest generated by the meeting. For those speculating that Mrs. Mugabe could be appointed vice president as her team advances their alleged plan to groom her for the top office in the land, Khaya-Moyo said the issue of vice presidents was resolved at the last congress where the party’s constitution was changed, allowing President Robert Mugabe to appoint his two deputies. Ordinary Zimbabweans have different views on the first lady’s political moves in Zanu PF and her alleged bid for the top political office in the country. Absolom Gwenya, a detainee at Hwahwa Prison during the war of liberation struggle, said Mrs. Mugabe’s future looks bleak in the absence of her husband. Denis Kagonye, publisher of The Mirror, the Mashonaland West provincial paper concurs. Kagonye said everything will change for the first lady once her husband leaves office. Another Chinhoyi resident, Cosmas Makwanya, said this is the time for Mrs. Mugabe to seek the top job in the land. At the same time, Alaska senior citizen, Artwell Mazarure, said there’s nothing wrong in Mrs. Grace Mugabe running the country. He said from what he has seen the first lady has the experience and knows diplomacy and politics as the president’s wife. He noted that Mrs. Mugabe’s political life depends on the president’s position. With all the speculation thrown into President Mugabe’s succession debate, it seems that only time will tell as Mrs. Mugabe is not saying much about her political future.